For each individual patient, the patient-physician interaction is unique and requires vulnerability, exposure, and discomfort. The high-throughput, short duration, and emphasis on physical exam of some dermatology practices may make them vulnerable to devolving into transactional medicine. A transactional relationship is an interaction based on the exchange of goods or services. This type of relationship works well in business but is not the implicit goal of the physician-patient partnership. It is critical for dermatologists to reflect on their practices to avoid exclusively transactional practices. 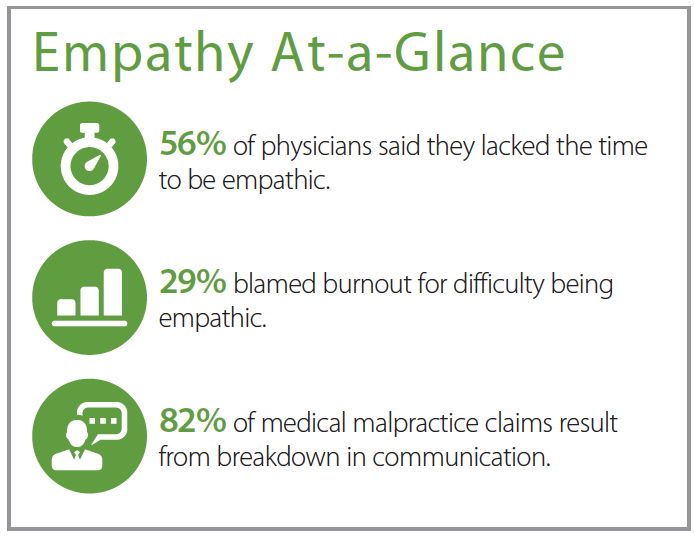 Empathy is an important skill that improves outcomes and efficiency while reducing physician burnout and medical malpractice claims. Contrary to popular belief, empathy can be both measured and learned. Practicing empathy can combat the detrimental attributes of transactional medicine. An 18-year-old female transplant recipient was referred to the dermatology clinic for assessment of a persistent rash on her right arm. She had previously seen a dermatologist with the same complaint years prior and had been told that the rash was benign and would resolve with time; however, the rash had progressed in the intervening years. The patient was extremely self-conscious about the appearance of the rash and avoided short sleeves due to its appearance. The rash involved the entire right extensor arm and appeared to continue onto the anterior chest wall. When asked whether we could examine her shoulder, back, and chest, the patient began crying. Further questioning revealed that her previous dermatologist had abruptly pulled her shirt down to see the rash without first conveying their next action. This experience had made her so uncomfortable that she did not return to the original dermatologist despite continued spread of the rash. The impact of the rash on the patient’s self-esteem and daily functioning was extreme—to the point where she would not even allow her own mother to view her arm. For a transplant recipient on immunosuppressants, it is fortunate that this experience did not also lead to other negative health implications, as well. Even after explaining the need for a full cutaneous exam, the patient declined further assessment and has yet to return for a skin biopsy. In the transactional interaction, the physician may view the patient as a consumer whose medical problem must be solved as quickly as possible instead of exploring appropriateness of care, patient values, and unexpressed patient needs. In this model, the physician becomes a technician or a salesperson, focusing on providing a biomedical treatment for the patient’s disease without comprehensively exploring the patient’s illness and impact on the patient’s life. Physician-patient interactions that are especially prone to a transactional format are those where patients alone set the priorities of the medical visit and dictate the agenda and treatment and those that are repetitive, short, or where a diagnosis and treatment plan can be made often on visual inspection alone. 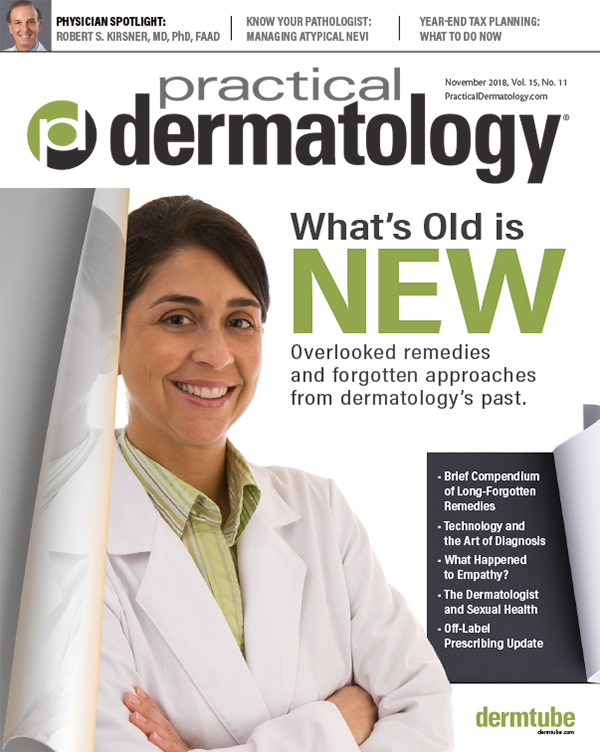 For these reasons, certain dermatology practices may be especially vulnerable to a transactional physician-patient dynamic. For physicians, the medical emergencies and personal crises of their patients can become commonplace. Worse, they may come to be viewed as inconveniences. Routine complaints like acne or mild eczema may be viewed as unimportant when compared to more serious pathologies. In contrast, patients may anticipate their medical appointment for months in advance; they may fear receiving a serious diagnosis or being told that there is nothing that can be done for their medical problem. Or their specific fears may be completely unique and surprising to the physician. The prognosis of “mild” conditions does not speak to the impact of symptoms on a patient’s quality of life. Though a physician may see 50 patients per day with the same complaint, for each individual patient, the patient-physician interaction is unique and requires vulnerability, exposure, and discomfort. The case example above illustrates this. When the nature of the medical encounter is transactional, the physician is less likely to act empathically. The seemingly generic nature of the encounter, the speed at which it is conducted, physician performance quotas, and even the patient’s approach to the meeting can make the conditions of the transactional encounter less conducive to empathic care. Research demonstrates that the decline in empathy or “empathy erosion” begins in medical school. One study identified a significant decline in empathy during the third year of medical school, ironically a time when the curriculum becomes more oriented toward patient-care activities where empathy is most essential. Why is empathy so important in the patient-physician encounter? It’s better for the patient, it’s better for the physician, and it’s actually better for business. We don’t need to deny the aspects of some practices that are enterprise-focused, rather, we can be aware of them and then address how they may impact the delivery of care. Where the patient is treated with empathy, they are more likely to disclose all relevant information related to their condition and return for subsequent or follow up appointments. Empathy is better for business. Providing empathic care does not necessarily increase cost or time with patients. In fact, empathic interactions with others can actually save time and be more effective. Client retention and word-of-mouth marketing are likely to increase as a result of empathic care. Lower physician burnout means greater productivity. The term “empathy” often conjures up ideas of unnecessary emotionality. Some providers may view empathy as something that happens automatically. People may believe that since empathy doesn’t happen automatically for them, they just aren’t good at it (and so why bother?). Fortunately, these views are incorrect. Social science researcher and author Karla McLaren describes six components of empathy; five of the six are intentional and can be developed. 1. Emotion Contagion: The ability to sense an emotion is occurring—or that an emotion is expected of you. 2. Empathic Accuracy: The ability to accurately identify and understand emotional states and intentions in yourself and others. 3. Emotion Regulation: The ability to understand, regulate, and work with your own emotions. Emotion regulation requires self-awareness. 4. Perspective Taking: The ability to put yourself in someone else’s shoes and sense what they might be feeling in order to understand what they might want or need. 5. Concern for Others: The ability to engage with others in a way that demonstrates your care and compassion. 6. Perceptive Engagement: The ability to make perceptive decisions and to respond or act (if necessary) in a way that is appropriate for the other person’s needs. Empathic accuracy, emotion regulation, perspective taking, concern for others, and perceptive engagement can be learned; empathy is not whimsical, mysterious, or involuntary. This means that acting empathically can take effort, and making that effort is a choice. In medical practice, physicians can actually choose to act empathically, although often there may be a lack of awareness that a choice has been made. Sometimes a failure to act empathically may be a result of particular unconscious biases we may have related to certain types of people. The more obvious biases are connected to things like race, religion, and sexual preference. The less obvious biases could be connected to things like people who are overweight or unclean, do not follow the recommended course of treatment, avoid eye contact, or don’t communicate clearly or politely, for example. When a patient fails to communicate empathically themselves, a mirror response may occur from the physician (what is referred to as “complementary communication”). A client demanding a certain treatment or service or approaching their interaction with a physician as a transaction can also cause a mirror response from the physician who might then bypass their usual empathic responses. On some occasions, an attempt to respond to a patient empathically might backfire where a patient directly or indirectly lets the physician know that they found their response inappropriate. In this case, the “failed attempt” at empathy can make the physician retreat in defense and skew the rest of the interaction. Similarly, a sense of a general lack of empathic skill may cause a physician to try to maintain a more objective and less personal approach to their interactions overall out of fear of their lack of competency with their softer skills. In these cases, it is important to remember that empathy can be developed. The resources below provide some options for strengthening the empathic muscles. Even those who are innately empathic can improve and develop their empathy skills. In addition, people who are empathically inclined may be more prone to certain “empathy pitfalls.” These include over-empathizing, which can result in “empathy burnout;” making unprofessional or even unethical decisions as a result of emotional engagement with a patient and projecting their own experience and feelings onto the patient, thereby misinterpreting the patient’s communication. The first step in moving toward a more empathetic practice is to reflect on or measure your empathy. The Greater Good magazine empathy quiz (greatergood.berkeley.edu/quizzes/take_quiz/empathy) is based on validated scales used in research to measure empathy and are able to measure different aspects of empathy, including affective empathy (the ability to recognize other people’s emotions) and cognitive empathy (the ability to imagine another person’s perspective). Empathy can be increased in medical practice using active listening, a technique that allows the patient to express their feelings and perspective without interruption and then summarizing your understanding to ensure accuracy. Questions such as, “What are you most worried about?” or the phrasing, “What questions do you have?” instead of, “Do you have any questions?” can open up discussion. Actively seeking shared identity with patients can activate empathy organically. Prior to seeing your patient, take a moment to mindfully bring up a time that you or a loved one was a patient seeking care. Cultureofempathy.com Includes references to books, conferences, and measurement tools on empathy. It also includes numerous video interviews with empathy experts. Empathetics.com Empathetics is a company founded by physician and empathy expert, Dr. Helen Riess, that provides empathy training for medical professionals. Karlamclaren.com Karla McLaren is an author, researcher, and empathy expert who developed the Six Essential Aspects of Empathy model that highlights all of the processes in healthy empathy, making empathy understandable and learnable. The patient case outlined above highlights the consequences of transactional encounters on patient care and demonstrates the potential for empathy to counteract these effects. Adopting the perspective of the original dermatologist provides insight to the encounter. The original dermatologist was likely well-meaning. Perhaps the doctor had already constructed a differential diagnosis and was rushing to examination of the rash as the key diagnostic piece. Perhaps their mind was elsewhere, and they simply forgot to explain the physical exam. Perhaps the exam was explained and consent obtained, but the patient’s emotional cues were misread. There are many plausible explanations. Practiced empathy can reduce the transactional nature of a medical visit by requiring the physician to be present. The physician actively listens to the patient complaint, paying special attention to the non-verbal cues and body language of the patient, and summarizes both the biomedical symptoms and emotion, checking with the patient for accuracy. In addition, the physician imagines him or herself as the patient, slowing down the automacy that is characteristic of transactional medicine, and leading to empathetic practice. Disclosures: Ms. Stanley-Bhanji is CEO of a non-profit organization. The authors have no relevant disclosures related to this work. Salima Stanley-Bhanji is the CEO of Humanologie, a Canadian charity whose mission is to spread empathy, increase inclusion and reduce discrimination. She is also a lawyer, film maker and yoga teacher. Danya Traboulsi is a fifth-year resident in dermatology with an interest in gyne-dermatology, psycho-dermatology and medical education. She was chief resident and has received numerous awards including the Resident of the Month. Shannon Ruzycki is a general internist, co-chair of the Department of Medicine Gender Equity Task Force and Associate Director of Physician Wellness and Vitality at the University of Calgary. 1. Riess H, Kelley JM, Bailey RW, Dunn EJ, Phillips M. Empathy training for resident physicians: a randomized controlled trial of a neuroscience-informed curriculum. J Gen Intern Med. 2012 Oct;27(10):1280-6. 2. Hojat M, Louis DZ, Markham FW, Wender R, Rabinowitz C, Gonnella JS. Physicians’ empathy and clinical outcomes for diabetic patients. Acad Med. 2011 Mar;86(3):359-64. 3. Rakel DP, Hoeft TJ, Barrett BP, Chewning BA, Craig BM, Niu M. Practitioner empathy and the duration of the common cold. Fam Med. 2009 Jul-Aug;41(7):494-501. 4. Kaptchuk TJ, Kelley JM, Conboy LA, Davis RB, Kerr CE, Jacobson EE, Kirsch I, Schyner RN, Nam BH, Nguyen LT, Park M, Rivers AL, McManus C, Kokkotou E, Drossman DA, Goldman P, Lembo AJ. Components of placebo effect: randomised controlled trial in patients with irritable bowel syndrome. BMJ. 2008 May 3;336(7651):999-1003. 5. Krasner MS, Epstein RM, Beckman H, Suchman AL, Chapman B, Mooney CJ, Quill TE. Association of an educational program in mindful communication with burnout, empathy, and attitudes among primary care physicians. JAMA. 2009 Sep 23;302(12):1284-93. 6. Shanafelt TD. Enhancing meaning in work: a prescription for preventing physician burnout and promoting patient-centered care. JAMA. 2009 Sep 23;302(12):1338-40. 7. Hickson GB, Federspiel CF, Pichert JW, Miller CS, Gauld-Jaeger J, Bost P. Patient complaints and malpractice risk. JAMA. 2002 Jun 12;287(22):2951-7. 8. Halpern J. Gathering the patient’s story and clinical empathy. Perm J. 2012 Winter;16(1):52-4. 9. Shanafelt TD, West C, Zhao X, Novotny P, Kolars J, Habermann T, Sloan J. Relationship between increased personal well-being and enhanced empathy among internal medicine residents. J Gen Intern Med. 2005 Jul;20(7):559-64.